Tom Tim’s got a tiger by the tail. He has a plot of land to sell, buyers are scarce as hens’ teeth, and… well… he lives in the middle of Murder Central. Whoda thunk a drowsy Minnesota town could earn that title? Tom certainly didn’t. In fact, he’d probably ditch his dead end position at Crossroad’s Realty if it weren’t for the ever gorgeous Sara Smith. If he had a ghost of a chance with that woman, she’d be worth every drop of crazy mayhem erupting all across Crossroads. 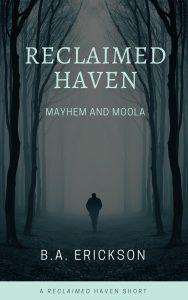 But, with murders, disappearances, explosions… how can a guy hope to break through the clutter and impress a goddess like Sara? Will he get the girl? Will he ever sell that infernal plot of land? How can Tom and Sara avoid getting sucked into Crossroads’ vortex of crazy? 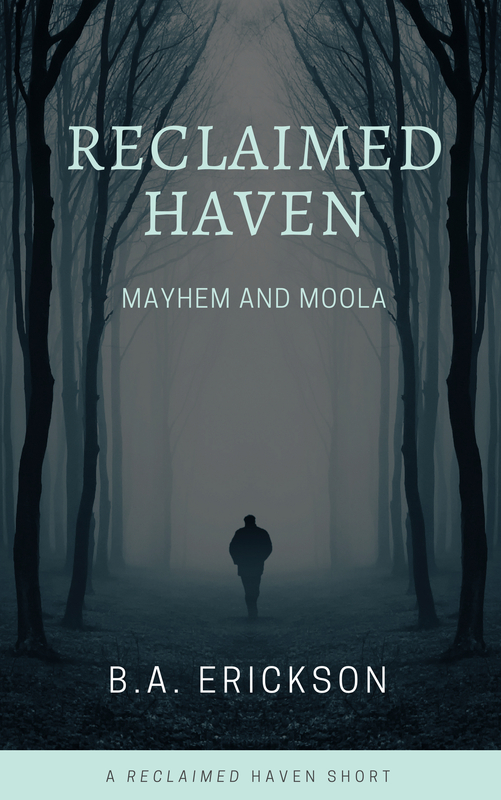 All these questions (and many more) will be answered (give or take) in this tiny volume of Reclaimed Haven: Mayhem and Moola.